Top 5 Lodging Options for Student Groups in Washington D.C.
Home » Print Editions » 2019 Edition » Top 5 Lodging Options for Student Groups in Washington D.C. When it comes to booking accommodations for your student group during your D.C. stay, many factors such as location, amenities and convenience can matter as much as price. 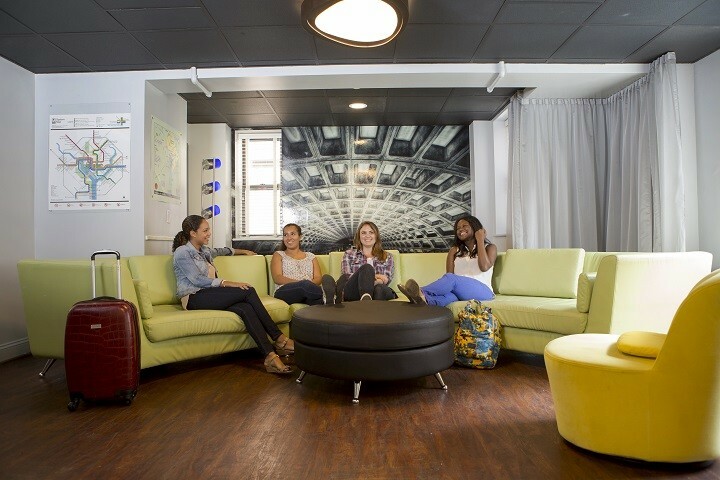 For leaders of a large student group to a big city, there is a lot to consider when it comes to choosing lodging. We’re here to make your search easier by offering our top five selections for the most accommodating options in D.C. for you and your group. These five options represent the spectrum of lodging options in the city, from affordable and welcoming hostels to trendy and award-winning hotels, all combining superior quality with reasonable pricing to create a safe and comfortable environment to call home during your time in Washington D.C.
Hostels are a logical lodging option for student groups on a budget, and one of D.C.’s best is the HI- Washington, DC Hostel. At a much lower cost than many hotels, this hostel provides the necessities for you and your group’s stay, including free Wi-Fi, continental breakfast and convenient access to the metro, the White House and the National Mall. Other fun amenities include a common room, a game room, a TV room, laundry facilities, a library, a pool table, a full-size self-service kitchen and weekly schedules of free social activities such as trivia night and tours. The hostel offers single gender and co-ed options for rooms of four, six or 10 beds in bunk-bed style or double rooms of one full bed. Interested group leaders should visit the hostel’s website for more information. 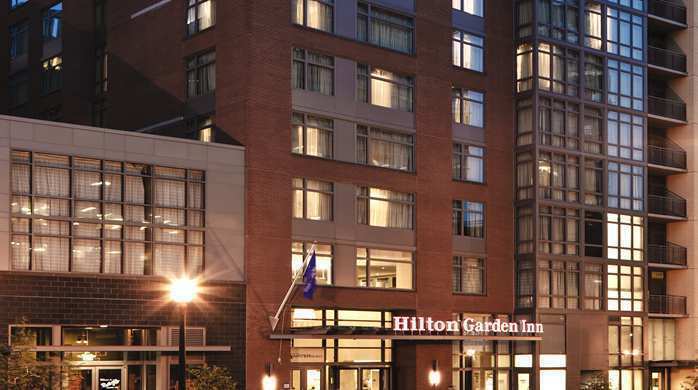 The Hilton Garden Inn Washington D.C./U.S. Capitol’s many amenities and features to fit any traveling group’s needs make it an excellent option for you and your student group. Not only does it house 24-hour fitness and business centers, an indoor pool and the Pavilion Pantry convenience market, the rooms are also equipped with free Wi-Fi and beds with adjustable firmness settings. In addition, the hotel has an on-site restaurant, Lily & the Cactus, which serves modern Southwestern American cuisine with a West African flair. For groups looking to host a meeting or event during their stay, the hotel’s four event spaces can accommodate from 12 people in its smaller rooms up to 300 in its ballroom. AV equipment rental and catering options are also available through the hotel. To look into booking the Hilton Garden for your trip, visit the hotel’s website. To experience high-class living without breaking the bank, check out The Kimpton: Donovan hotel. This downtown location provides excellence of quality and service and puts the extra effort in to make your stay there extraordinary. This hotel has amenities such as free Wi-Fi, a 24-hour fitness center, 24-hour business center and complimentary coffee and tea each morning. One of the hotel’s highlights, however, is its rooftop lounge and seasonal 20-foot-long rooftop pool that attract visitors coming to the capital city. The hotel includes 5,000 square feet of private indoor and outdoor function space available for groups to reserve. Its three main event and meeting rooms, the Bradlee Room that seats 40 people and the Woodward Room and Bernstein Room that each seat 100, have recently been renovated and redecorated with a journalism theme to honor the investigative reporters they are named after. Head over to the hotel’s website to see what other perks it has to offer. For groups looking for a high-quality hotel in a prime location, the Capitol Hill Hotel is the perfect pick. 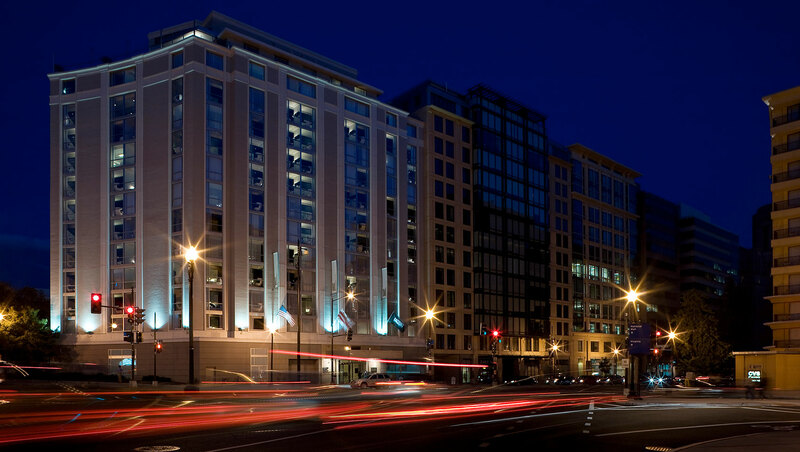 This hotel is within walking distance of landmarks like the Supreme Court Building, the Library of Congress, Capitol Hill, Union Station and the National Mall. Guests won’t go hungry here, as daily continental breakfast is included, each room is equipped with either a full-size kitchen or a kitchenette and microwave and the hotel has its own 24-hour market in the lobby. This hotel also offers library, 24-hour gym and business center services to its guests. Capitol Hill Hotel also contains two multi-use lounge spaces and three meeting rooms, The Boardroom for 12 people, The Independent for 16-30 people and The Parlor for 10-35 people. To look into booking rooms for your group, visit the hotel’s website. 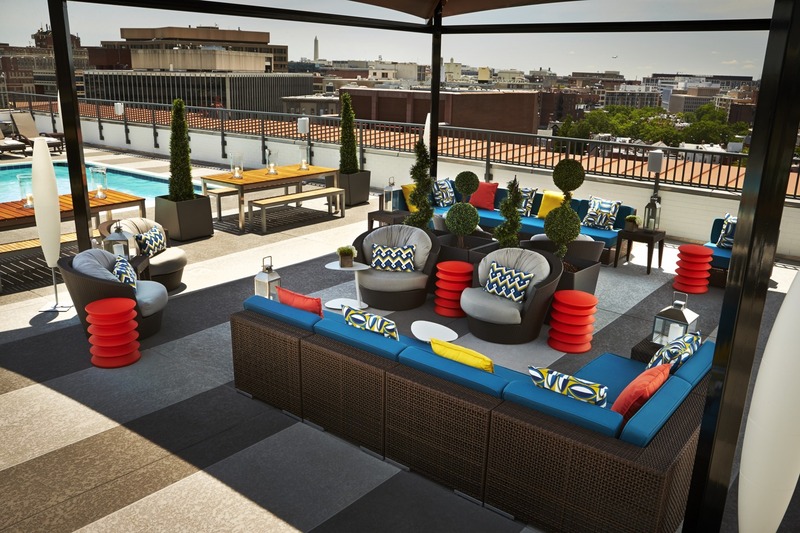 Named for residing on the same street as many countries’ embassy buildings, The Embassy Row Hotel is sure to leave a lasting impression on you and your group. 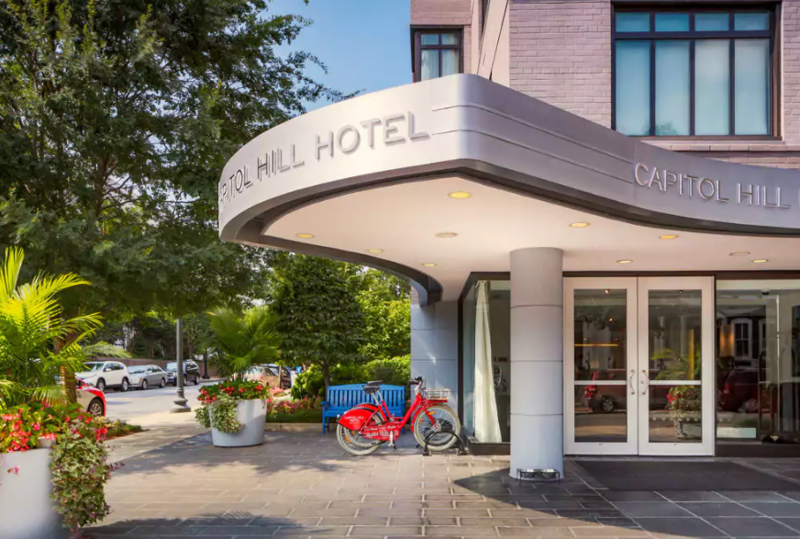 Located in the convenient Dupont Circle District with nearby access to the metro, the hotel’s neighborhood of eclectic art, music, boutiques and dining puts the city’s culture right at your fingertips. It’s easy to see why USA Today named this hotel one of the Top 10 Best New Hotels in America – the hotel features an on-site restaurant, Station Kitchen + Cocktails, Underground Playground, a game an activities center for foosball, ping pong and air hockey, Urban Fit Club Gym, one of the largest hotel gyms in D.C. and a rooftop pool complete with a grill, daybeds and a shaded lounge area. Other amenities include free Wi-Fi, the 24-hour Chef’s Pantry + The Coffeehouse, a community library, and pop-up rooftop yoga sessions. To experience all this hotel has to offer for yourself, book your rooms through the hotel’s website.